This CD set provides a near-complete overview of the Hungarian pianist's career, from his earliest recitals in wartime Berlin up to his premature death of cancer in early 1976. 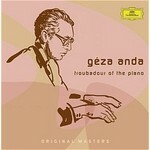 Géza Anda (1921-1976) was the epitome of keyboard elegance" wrote the renowned piano music critic Bryce Morrison. Wilhelm Furtwängler referred to Anda as a "troubadour of the piano" on the occasion of a joint concert they gave in 1943, around the time of the earliest recordings in this set. Anda was a disciplined perfectionist who worked painstakingly at his interpretations, his technique and the master classes he gave. This CD set provides a near-complete overview of the Hungarian pianist's career, from his earliest recitals in wartime Berlin up to his premature death of cancer in early 1976. The early Liszt performances remind us of Anda's Hungarian background, while the other early Romantics also feature prominently. As Morrison puts it, "Anda's Chopin, Liszt and Schumann - and, most particularly, his Schumann - were all enlivened and illuminated by his magic, his coruscating wit and refinement, the products of a phenomenally acute ear and of the reflexes of a born musical athlete." Separate interpretations of Schumann's Etudes symphoniques from 1943 and 1963 provide the opportunity to appraise Anda's artistic development. Nearly all of the recordings in this set were either out of production or have never been available on CD internationally, and the 1942-3 recordings, apart from the Schumann, are all receiving their first official CD release. In the case of the Franck Symphonic Variations with Eduard van Beinum we were able to locate a tape copy from the since-destroyed original metal parts, permitting optimum sound quality. The concerto recordings in the set showcase distinguished partnerships with van Beinum, Rafael Kubelik and Ferenc Fricsay. The last movement of the Brahms Second Piano Concerto with Fricsay has long been famous for its authentic Hungarian atmosphere. Of the solo works, Anda's interpretation of Schubert's posthumous B flat Sonata is appearing on CD for the first time.